In the photo: marigolds in the landing near the fountain. In the wild, these little suns are rising in the countries of South and Central America. They are cultivated in Chile and Mexico, France and Brazil, Belgium and Morocco. 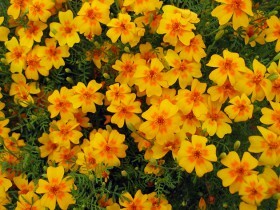 Small marigolds are found in the Western Caucasus. Among gardeners, this colourful flower deserve a lot of praise, in the garden landscape particularly prized varieties with major, double flowers. 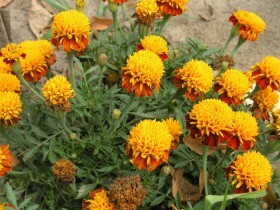 Other names of marigold – barchacky, chernobrivtsi. Legend has it, once the flowers were children, black-browed and exciting. Sons kidnapped, the mother was looking for them, but never found. She was crying under the window, where children used to play, this place has grown beautiful flowers. The stems of the plants upright, form a shrub up to 120 cm. Foliage colour – dark- to light green. Terry inflorescences simple or, brown, yellow or orange. Flower profusely from mid-June to late autumn. In place of flowers formed a brown-black achene, planting material retains viable for up to three to four years. Scent can be unpleasant, but he is weak and the overall picture in the garden is unlikely to spoil. Marigolds near the garden path. These plants are fairly undemanding, undemanding to the proposed terms. Marigolds rejected is able to grow well even along busy highways, carry exhaust gases, could, not the best condition of the soil. Almost all varieties prefer a well-lit Sunny areas, although in terms of dimming, they are able to please their flowering. A great part of the soil – fertile soil, loam, regular watering is optimal. The plant responds well to timely feeding, for the whole period of vegetation, such work should be carried out two or three times. 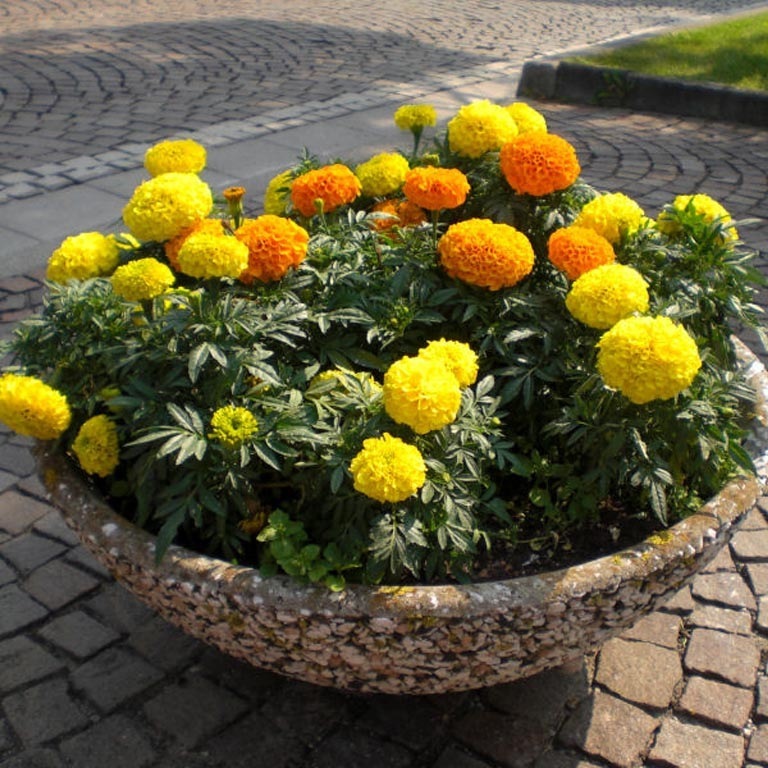 Marigolds – an indispensable culture for decorating flower beds and borders, they can be grown in shallow containers on balconies, separately or together with other annuals. An important advantage plants have an increased resistance to disease and pests. Volatile, contained in the leaves, well repel insects, not only from the marigolds, but from their neighbours next door.. Immediate measures need, if the plants struck gray mold, black leg, nematode and bacterial diseases. Seed propagation marigolds are sown in late may or the beginning of the first summer month. Shoots when the weather appears on the fifth or tenth day after sowing. To eliminate the trouble, the soil is better to cover the non-woven material lutrasilom or acrylic. If such a shelter provides, it is possible to sow earlier for a week or two than usual, flowering will be accelerated. The seedling method has its own peculiarities. In mid-March sown marigolds erect, fine-leaved and rejected – at the beginning of April. Bloom of all these types will begin in June. Planting material can be grown on bright window in the room or in greenhouse film. To obtain a healthy and good seedlings will need loose and fertile land, the optimal composition: as part of the peat, humus and sod soil, half parts sand. Provided by moderate watering and even air temperature from 18 to 22 degrees. Marigolds rejected less demanding on the soil. For narrow-leaved varieties is better to take fresh soil, they more often than other types of affected blackleg. Seedlings grown comfortable in a small container, in a pot, in the box. At the bottom poured drainage of expanded clay, crushed stone or coarse sand. Layer must reach three inches or to the bottom of the drawer apertures. Congestion in the soil can cause fungal roots. The drainage layer is poured two-thirds of the prepared soil layer, it is compacted with your hands. The next layer should be air, loose, the roots "breathe". Soil is poured on two or three centimeters below the rim of the container. The soil is well moistened, leave for a day or two in the heat. In the photo: seeds of marigolds. Seeds plants large enough, they are laid in the grooves at the distance of half an inch. Too dense planting will stretch, will be weak or get sick blackleg. In order to observe optimal planting density, the sown pre-germinated seeds. They spread out on a saucer, wet tissue, wrapped in a plastic bag and put the heat. The seeds will hatch in two to three days. They are laid on the soil surface and covered with a thin layer of soil half a centimeter thick or a little more. Too thin layer can dry up the planting material, too deep fitting, on the contrary, interfere with germination and sprouting. This is especially true of marigold narrow-leaved. After planting, the plants watered, cover with paper. During the week should be closely monitored for humidity and temperature, it should be within 20 – 22 degrees. The appearance of seedlings, the boxes are transferred to the lower temperature, from 18 to 20 degrees. The seedlings should stand in the light. Dense plantation dive. The procedure is performed after copious irrigation. Seedlings are carefully removed along with the lump of soil and planted in prepared hole, buried up to the cotyledons. This method will contribute to the formation of new roots. At the time of landing a well-grown seedling has developed a root system and two or three pairs of leaves. Plants bury in the ground one to two inches. 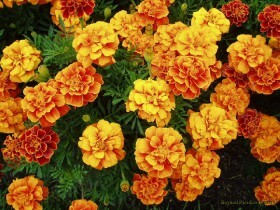 Erect varieties of marigolds, hybrids are planted at a distance 40 cm from each other, grade average residentsto – 30 cm, low – 20 cm. Plants can easily tolerate a transplant even in a state of flowering. 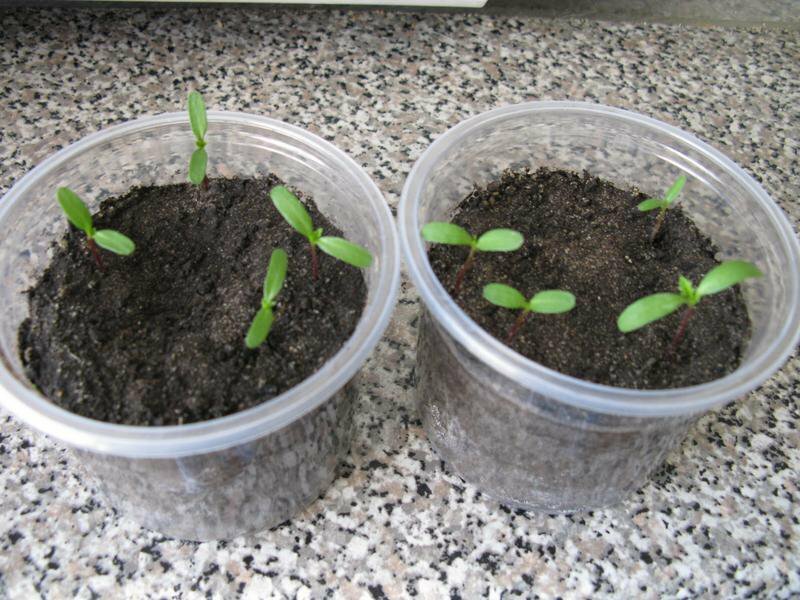 Seedlings of marigolds in small containers. Plants, grown on a commercial scale, harvested in the second decade of July. The flowers are cut and sent off for recycling. 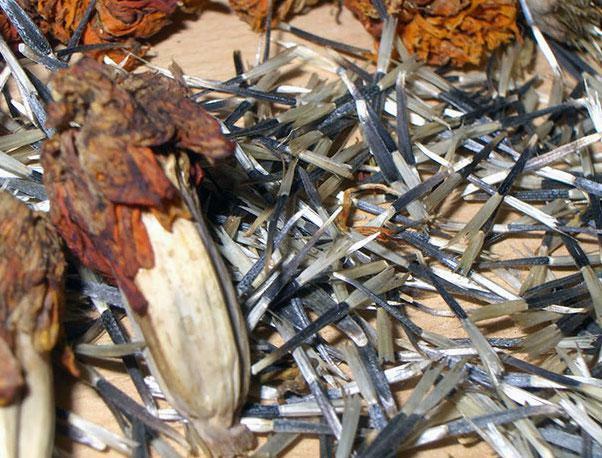 Marigold seeds are removed as they Mature, it is important to do it in time, otherwise, the planting material will simply crumble. After harvesting or cutting of the aisle well loosened. Smaller varieties are cut in the second half of September. Testes better to take on the shoots of the first order or the Central. After a brief drying, the seeds are easily removed from boxes. Store seeds in a dry, dark place. Among gardeners, there are three main types of plants: erect, rejected, fine-leaved. They are often called African, although this continent they have nothing. Homeland species – America. Inflorescence very large, Terry, diameter can reach 15 cm. Coloration from dark orange to pale yellow. Varieties differ in height: from the meter to half a meter. "Antigua" is a very small, just 20 cm, inflorescence large, to 10 cm in diameter, orange or bright yellow. 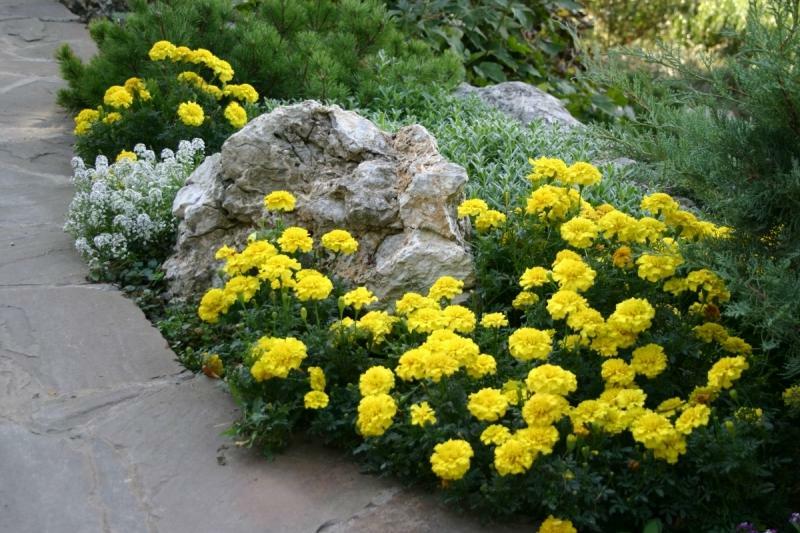 "Gelber Stein" – to 70 cm in height, the flowers look like chrysanthemums, Golden yellow. "The gold dollar" – high grade, to 120 cm in height. Shoots ribbed, durable, light green. Foliage – dark green, large. Flowers like carnation, Terry, round, odorless, color – reddish orange. The variety blooms from early summer until the first frosts. Recommended for cutting, and creating high groups. "Goldlight" – compact bushes up to 75 cm in height. Shoots are light green with a beautiful reddish patina. Leaves – dark green, large. Inflorescence similar to a carnation, Terry, spherical, color – bright orange. Late variety, beginning of flowering – end of June. "Sonnenshein" – stambena form bushes, up to half a meter in height, the leaves are green, large. 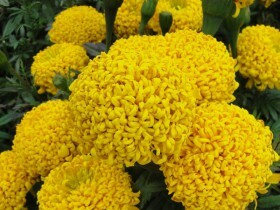 Clusters of Golden-yellow, similar to a chrysanthemum. Grade is recommended for group plantings. "Zitronen prayz" – standard form, to 80 cm in height, compact bushes, foliage dark green. Blossoms lemon yellow, similar to the balls. 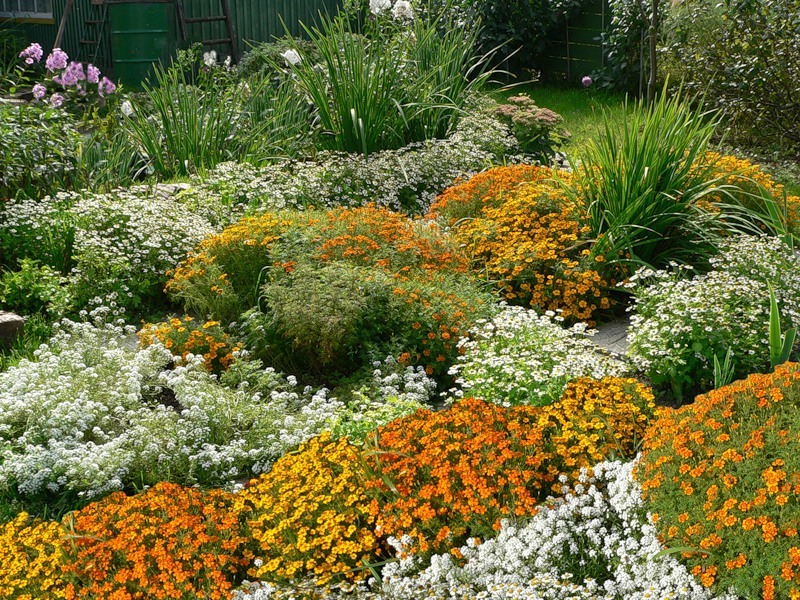 The variety is recommended for planting in groups and for cut flowers. In the photo: marigolds in the pot. This species is often referred to as the French. Low plant, to 40 cm. Inflorescences can be either double, not Terry, orange and yellow, red-brown, to 7 cm in diameter. "The gold ball" – spreading shrubs, up to 60 cm, shoots with a reddish tinge. Flowers – reddish brown, simple or semi-double, tubular flowers – Golden yellow. Early variety, blooms from early summer, recommended for cutting. "Gold Smoked" low, compact clumps, the dark green leaves of medium size. Terry inflorescences, Golden yellow with dark red ray flowers. Grade is recommended for create ridges, flower beds, culture can grow in pots and decorate the balconies. "Queen Sofia" – Terry inflorescences, the combination of bronze-orange, red and brown. Subject to fading in Sunny weather, diameter – 7 cm. 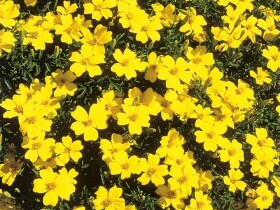 "Lemon Jam" – a short plant with strong stems and double flowers. The size of the inflorescence of small – to 4 cm in diameter, color – bright yellow. 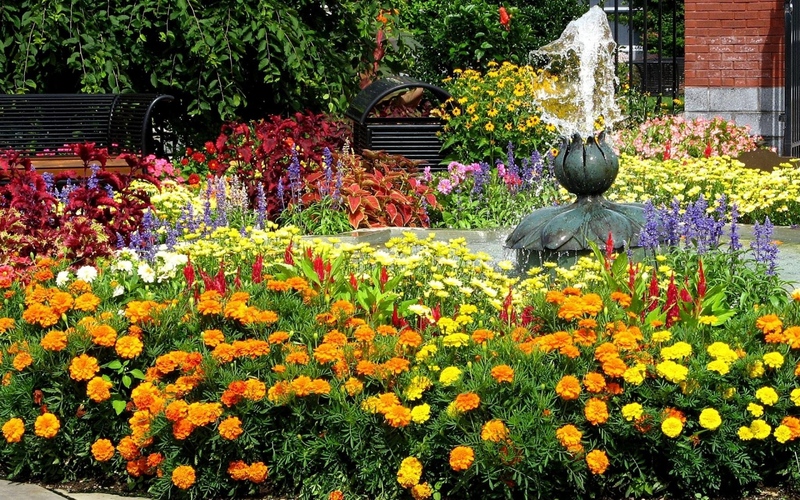 Bright colors are recommended for decoration of borders and flower beds, for cultivation in vases and balconies. "Orange the flamma" – densely leafy low bushes, leaves – small, narrow. Blossoms resemble chrysanthemums, Terry, small, the combination of bright orange, red, red-brown and yellow shades. 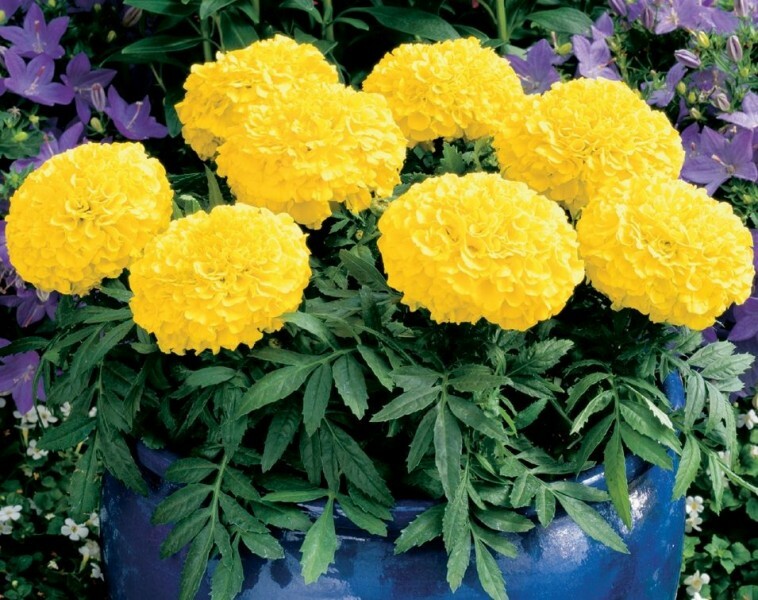 "Power ball" – a spreading Bush of medium size, inflorescences simple. Colors – from dull yellow to brown-red hues. Grade is recommended for cutting. The leaves in this species of culture openwork, split, the flowers are small, simple, red, orange and yellow tones. Plants photophilous and heat-loving, drought-resistant. Seeds are sown seedlings with the onset of the warm season, in early April. Seedlings should appear within a week. Plants can easily tolerate a transplant at any time, bloom before the frost. "Golden Ring" – the average height of the shrub, spherical, compact. Shoots are fragile, thin, light green. Leaves dissected, inflorescences of small size, to 3 cm in diameter. 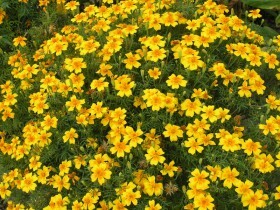 Flowers – bright yellow with orange and brown dots. Grade is recommended for high curbs and borders. Gnom – low look, shoots light green, durable. Inflorescence – small, orange. "Dwarf" is used in the plantings in the flower bed, in arrays, ridges, curbs, as container. "Lemon Gem" – branched plants, well and bloom profusely. Light yellow blossoms with a hint of lemon. 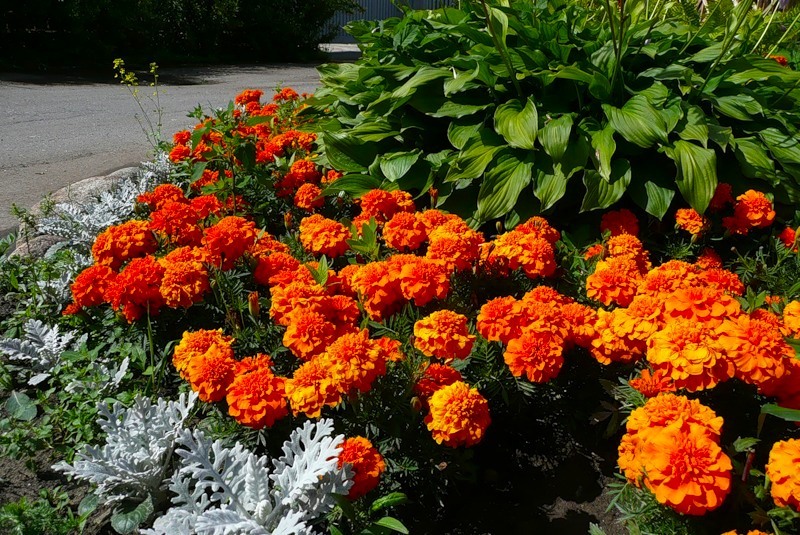 Orange marigolds – the Sunny flowers. The essential oil of anise has a spicy smell with fruity notes. It is widely used in liquor and perfume industry. In some countries of Europe and Latin America, Caucasus barcharts – one of my favorite spices. Used in food dry, grind into powder baskets plants. The seasoning added to dishes of vegetables and beans, sauces and soups. Little sun flowers, marigolds adorn any suburban area, vibrant culture is one of its kind able to lift the mood. Sort Of “Orange The Flamma”. The Sort Of “Queen Sofia”. All content on this site SamDizajner.ru written specifically for Simdesigner, copying 1 in 1 strictly prohibited. Reprint, full or partial rewriting of the article “Terry marigolds – planting and cultivating”, possible, only when you specify the full, active link to the source.